"The noted Hungarian tenor Sandor Konya was surely the most successful Lohengrin of the 1950s and 60s, and I think a legitimate case can be made that he was the finest Lohengrin after Lauritz Melchior. Konya had a voice that combined power with a liquid tonal beauty, enabling him to sing with dramatic thrust and tenderness as the music required. He made a fine appearance in a studio recording of the opera in 1965 (RCA) with Erich Leinsdorf and the Boston Symphony, following a series of Tanglewood performances (three performances of one act per concert). There is not a clear 'best' recording (longtime FANFARE readers know of my allergy to naming 'bests'), but this one is certainly on a par with the two Bayreuth performances. Matacic, a much under-valued conductor, may lead the most powerful and incisive of the three performances, but Cluytens and Rosenstock are not routiniers. 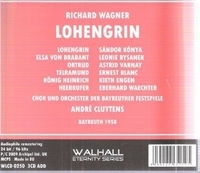 Any Wagner collection would be incomplete without a representation of Konya's Lohengrin."